Where does all the stuff go in an expedition kayak? I certainly didn't know. And I didn't know that the hardest part of my trip was going to be in securing the bungee cords over my two duffle bags. The kayaks have two underwater compartments, in the front and back. The front compartment was filled with the water bottles. I also stored the tiki lights and solar shower there. The smaller rear compartment held the tent and bedding. I managed to squeeze my fins in there too. There is a removable pod, the red triangular shaped box. That was used to store most of my food. There are two dry bags bungeed to the kayak. One contained the cooking kit and the other my personal items and excess food. At the beginning of the trip I had a very difficult time getting the two bags under the bungee cords. My personal items packed in the dry bag were long pajama bottoms and a T shirt and flip flops. (I wore a bathing suit, long sleeved rash guard and water shoes while kayaking. I also wore a baseball cap and used a sarong to cover my legs from the sun.) That's all the clothing that I had with me. Also packed was a small toiletry kit. Most of the space in my personal dry bag was taken by food that I could not fit into the pod. I had some crackers and snack cakes that took up space. Plus I bought toilet paper that turned out to be unnecessary. I suggest packing the least amount that you can in your dry bag. I would also suggest eliminating items that you won't be using from your cooking gear bag. I also had a waterproof box. There I kept my camera, matches and lighter, money, book to read and notepad. The waterproof box sits on top of the kayak between your feet. There is a belt that is attached to the kayak that you thread through the box handles and hook back to the kayak. Behind the kayak seat there is a large zippered pocket. There I put my snorkel, rain poncho, snacks for while kayaking (GU gels and dried fruit). Between the space where your legs go there is a small compartment perfect for storing sun screen. 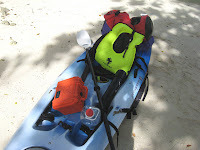 Plant Blue Kayaking gives you the pod and your dry bag the day before so that you can pack your supplies at your hotel. 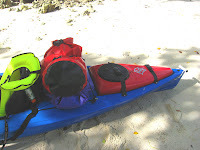 When I was dropped off at Ulong Island the shuttle boat driver showed me how to pack the rest of the kayak. He also pointed out the indicator which shows you which side of the paddle goes into the water on which side of the kayak (who knew? ).